While checking the load balancer metrics we could see that the request to the load balancer started to increase from 09:30 AM (IST), the number of connection request to the server started to increase from 10k and reached the peak request value of 737k by 10:35 after 10:35 the request started to decrease to around 100k by 10:55 AM (IST). From 11:10 AM the load balancer request count reduced to around 60k and stayed around 50k till 12:00 PM, after 12 PM we can see that the request reduced again to stay around 30k and is continuing at around 15k till 02:00 PM. 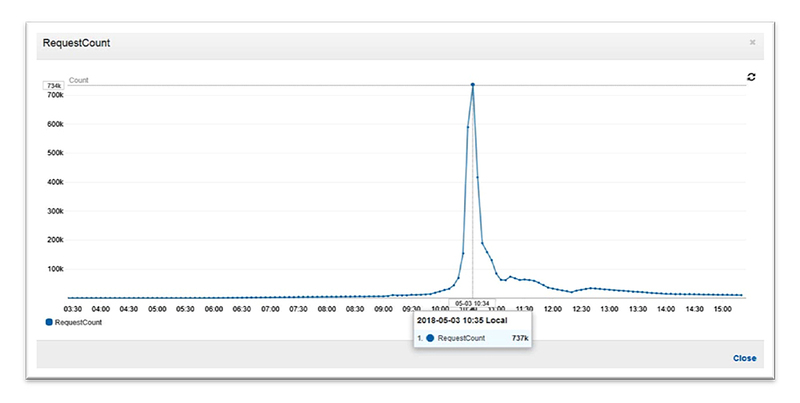 Above is the load balancer metrics chart , the load balancer peak request count: 737000. So to summarize the whole thing there was around 4.4M (44 Lakhs) requests to the server so there was a total request from around 2.3M (23 Lakh) user requests with the peak time request of 3.6 Lakh users.